We're excited to partner with Tech Inclusion New York for the third year in a row, focusing on diversity & inclusion. 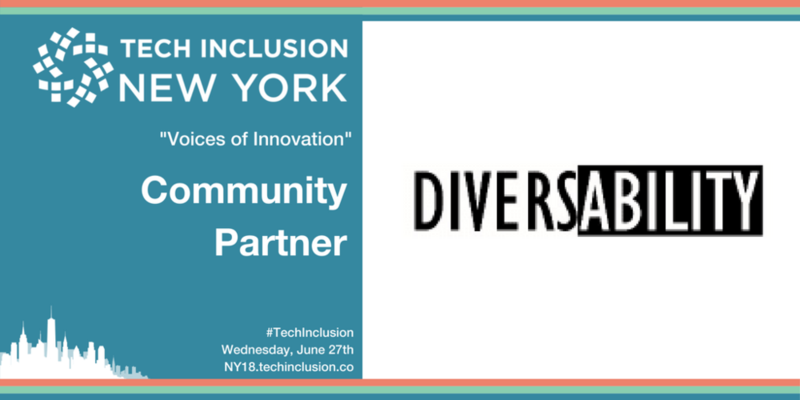 We’re excited to partner with Tech Inclusion New York for the third year in a row, the annual convening of the tech industry to focus on solutions to diversity and inclusion! This year’s theme, “Voices of Innovation,” features diverse, underrepresented voices building the innovative technologies and cultures of our future. It’s a full day of keynotes, panel discussions, solo talks and an interactive session focusing on inclusive innovation across the tech ecosystem. The day closes with a Happy Hour in the evening to network, debrief and unwind. Below are a few of our Diversability community members who will be in attendance on Wednesday, June 27. We asked them to tell us what tech inclusion means to them and which speakers they’re excited about! “Many of us don’t realize it, but today we are living in the future. And the future can be way better than this. To me, Tech inclusion means finding ways to enable all people to live a happy life in this future. I’m very interested in building and tweaking technology to not only help people with disabilities but also empower people with disabilities to help others. “Tech Inclusion means a great load to me, being a “transplant” from another industry (education) into tech. It is my chosen field, where I am a minority many times over (disability, race, gender, transfer), and as such, I have been working for years to entrench myself into the industry as well as to encourage others like me to transition into tech, knowing what I know now. “To me, tech inclusion is a holistic view of the diverse human beings that make up the tech world. It means consciousness around the experiences, whole stories, and backgrounds of the people that are involved in helping our world move into the future, through the innovations that they make. “Tech inclusion is the ability of a technology to be designed to be used by the wide spectrum of humankind with different abilities, backgrounds, and experiences as well as technology companies inviting, welcoming, and engaging that same spectrum of humankind to contribute fully into the company and its culture. It means that I don’t have to worry about my brother who suffered a horrible accident in how he is treated or perceived in his value to the company. It means more of my friends of color and women who represent a more significant portion of society are represented in their perspective in developing tech and within companies such that they can bring their most valuable part of themselves to work: themselves. “I’ve experienced first-hand the capacity that technology has to empower people with disabilities to live more independently and autonomously, as well as even the playing field, both because I myself am disabled and because I spent the first 18 or so months of my career teaching computer literacy to young adults with developmental disabilities. My time teaching also enlightened me to what I see as the 2 biggest barriers to computer literacy: socioeconomic status and the ability to read and write. I hope that by connecting with and contributing to the Tech Inclusion community, I can raise awareness about these challenges and help to create solutions. As society becomes increasingly dependent on computers both for work and play, these challenges also become increasingly prevalent and profound. More and more jobs rely on computers, but some people with disabilities may be deterred from pursuing these positions because they can’t afford a computer or smartphone to gain experience using them, or they don’t know how to read and interact with the content presented on these screens or write and/or otherwise create their own content. You can read more about Sam’s experience attending Tech Inclusion last year here.